Everyone loves vinegar, it is a savoury delight with almost three known uses. However, if you're like me, you will be baffled by the array of vinegars you can find in your local store's vinegar aisle. Further complicating matters, upmarket stores such as Oil & Vinegar sell speciality vinegars galore, when all a lot of us want is a cooling vinegary sip at the end of the day. Continuing in this site's proud vein of public service, I have decided to review all the vinegars you may be confronted with in your daily life, so as to make at least one vital part of every day as trouble-free as possible. 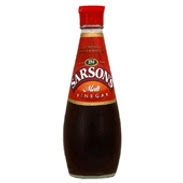 The undisputed market leader for all your chip needs, Sarsons boast that 5.5 million litres of their vinegar is sloshed onto the nation's chips every year. How would it stand up to our three-point test, though? Our total for Sarson's: 20/30 a high watermark for its rivals. NOTES: Sarson's also provide a light version of their vinegar, which fared a little worse on the chip test but a little better with the salad, plus being more forgiving for any freshman pint drinkers. Also in their range is a pickling-strength product. This absolutely marmalised the chips, atomised the salad and created a strong sense of malaise during the pint test. 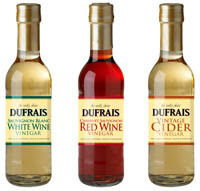 A common sight on supermarket shelves, Dufrais lead the UK speciality vinegar market, shifting 1.5 million units per year. Most common are the white wine, red wine and cider varieties. So as to factor in all of their different qualities, we mixed them together in a big bucket. For all of the choice of malt or fruit vinegars, one must also remember that for every name brand there will be another dozen supermarkets'-own varieties (I included the leftover vinegar from a chip shop's jar of pickled eggs within this test). Again, the mixing bucket came out for this one. The king of the vinegars, Balsamic has undergone a huge growth in popularity in the past decade, with every household in the UK now owning at least 400 bottles. The range, as is so often the case, is enormous. For this test, we forewent the bucket and instead settled on the top of the range Del Cristo, retailing at £96.57 for 100 ml. CONCLUSION: if you are looking for a really nice vinegar which is both flavoursome and versatile, look no further than Del Cristo Balsamic Vinegar! Warning: do not attempt to drink a pint of vinegar without adult supervision. Four vinegars!? Hardly comprehensive is it? I can think of at least...nope, I can only think of four. I don't believe you would ever spend that much on vinegar. My friend's elderly aunt used to recommended a clear vinegar for chips, I cannor remember it's name or I would have typed it here. Well, the important thing is that you believe I'd drink a pint of Sarson's. I am almost certain that you would.